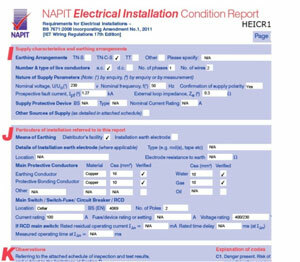 The Electrical Installation Conditions Report or EICR has now taken the place of the Periodic Inspection Report. These reports are also known as Electrical Reports and are Electrical Safety Reports on the electrical installation. The purpose of the Niceic Electrical Installation Condition Report (EICR) or Electrical Condition Installation Report is to determine, so far as is reasonably practicable, whether an electrical installation is in a satisfactory condition for continued service. This report provides an assessment of the condition of the electrical installation at the time it was inspected, taking into account the stated extent of the installation and the limitations of the inspection and testing. Every electrical installation deteriorates with use and time. Therefore, if the safety of the users is not to be put at risk, it is important that every installation is periodically inspected and tested by a competent person. Indeed, it is recommended in BS 7671: 2008 as amended (Regulation 135.1) that every electrical installation is subjected to Electrical Installation Condition Report [formerly Periodic Inspection] and testing. The inspection and testing should be carried out at appropriate intervals in order to determine what, if anything, needs to be done to maintain the installation in a safe and serviceable condition. The results of the inspection and testing need to be clearly detailed in a report. Any observed damage, deterioration, defects, dangerous conditions and non-compliances with the requirements of the current edition of BS 7671 that may give riseto danger should be recorded and appropriately classified for remedial action. It should be borne in mind that, as stated in the introduction to BS 7671, existing installations that have been constructed in accordance with earlier editions of the Standard may not comply with the current edition in every respect, but this does not necessarily mean that they are unsafe for continued use or require upgrading. The report is primarily for the benefit of the person ordering the work and of persons subsequently involved in additional or remedial work, or further inspections. The report may be required for one or more of a variety of reasons, each of which may impose particular requirements or limitations on the inspection and testing. The report is required to include details of the extent of the installation and of any limitations of the inspection and testing, including the reasons for any such limitations and the name of the person with whom those limitations were agreed. It should be noted that the greater the limitations applying, the lesser is the scope of the inspection and testing carried out, and hence the value of the report is correspondingly diminished. The report is also required to include a record of the inspection and the results of testing. The report provides a formal declaration that, within the agreed and stated limitations, the details recorded, including the observations and recommendations, and the completed schedules of inspection and test results, give an accurate assessment of the condition of the electrical installation at the time it was inspected. The main purpose of a Electrical Installation Condition Report [formerly Periodic Inspection] using a Electrical Installation Condition Report is to detect so far as is reasonably practicable, and to report on, any factors impairing or likely to impair the safety of an electrical installation.